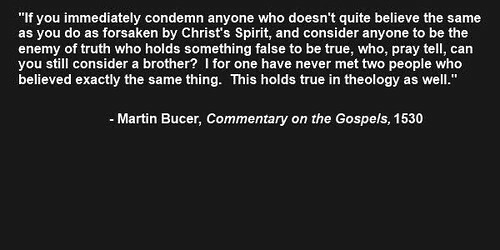 Bucer wrote extensively on ecumenism and what the differences are between good/right ecumenism and bad/wrong ecumenism. Ecumenism is, the principle or aim of promoting unity among the world’s Christian churches. Much like Bucer indicates, all people at one time in their lives, were material heretics, not yet privy to the error they believed, but through God’s grace, longsuffering, and patience we can trust that He will sanctify us out of it into conformity with the truth. When a brother believes something that is in error we bear with them, in patience and grace, lovingly correcting them from God’s word. Our hope is that the individual will move from material heresy to orthodoxy, rather than proving to be a formal heretic. Once someone is a formal heretic, we can pray for their conversion. God may use Satan to sift the material heretic, but the formal heretic, if he persists unto the grave, will suffer in Hell with Satan. By no means are we to call all men, “brother” who claim to be our brothers. Neither are we to include groups who have a different gospel, or worship a different god than the true God. This would make them appear to be legitimate to those in the laity, or general public. The Slippery Slope of Gay Marriage, as Evidenced by the Lawsuit Against Kim Davis, for not Allowing a Woman to Marry an Animal.